Sakrat is celebrated by Santal Indigenous people in 14th/15th January.Sakrat is also known as “BarabareDin”. 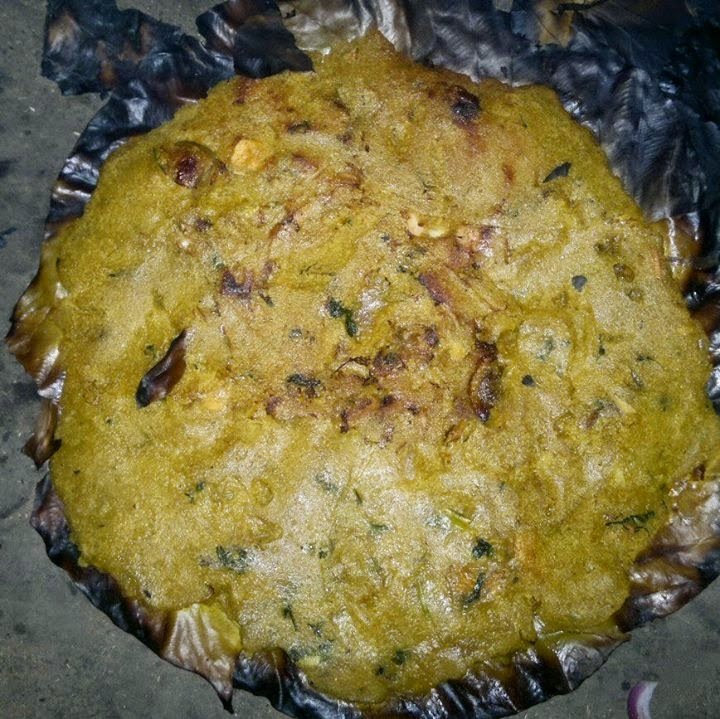 Haku Katom is celebrated one day before the Sakrat. This day is also known as “HologHurg Mah”( HologHurg Day).In this day People eat Fish+Meat+ Jill Pith(Bread which is made of Rice Flour and Meat) etc. This day people use Mustard oil in Leg,Hand,Stomach etc. Early morning of Sakrat. Santal has their own way to adorn themselves with ornaments. The change in the jewelleries has been come along with the evolution of clothing. In earlier years back, Santal women wore bangles made of terracotta which was called hasa-sakam (hasa-mud and sakam-bangle). They also used hasa mala (necklace made of terracotta beads). The beads were had made and it was dried after making it hollow. They used it as necklace by putting them in a sequence with a thread. The hasa sankha and the mala were worn by the women only. 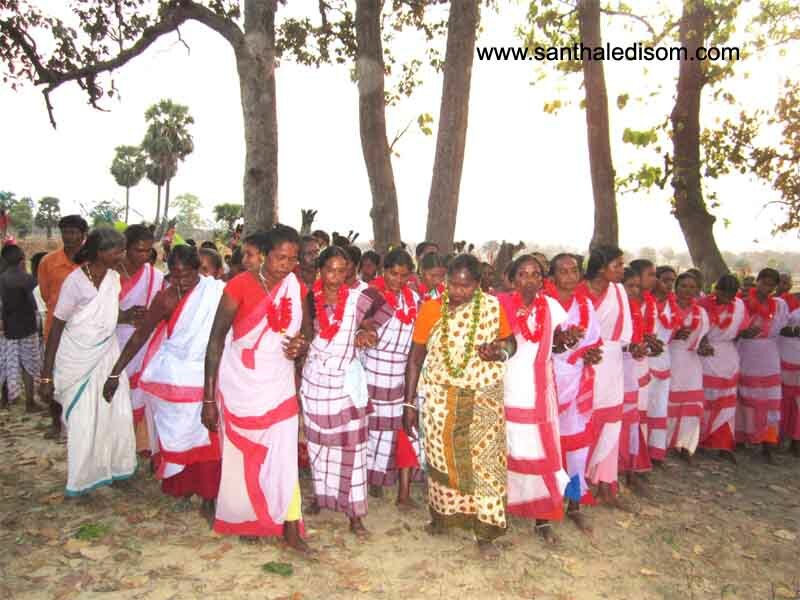 Santal people have very joyous living. As they have community living and thus in occasion of happiness, events and in any festival they celebrate it by singing folksongs and folk dance. Their dance consists of all holding each other’s hand which shows their communal unity. But in different occasion, events and festivals their dance form also varies .Like songs, in Marriage ceremony they sing ‘dong’ songs and same dances ‘Dong enej’ .In baha festival, they dance ‘Baha’. Different festivals have different dance forms. Santal has many dance form. There is mainly 8 dance form, which is traditionally accompanied by two drums: Tamak and Tumda. The flute (Tiriyo) is considered as the most important Santal traditional instrument which evokes the soul and feeling of nostalgia of Santals. Taking strides with drum the young men come forward and then the dance commences in two rows, their arms interlinking in pairs. The rows surge forward like rhythmic waves and then recede with supple footwork and swaying heads and bodies. The boys in the row opposite play on flutes, drums, and large cymbals and sing songs in perfect harmony. 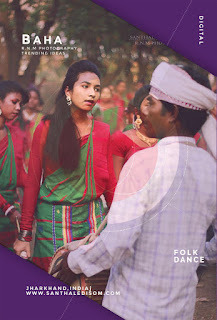 There are certain rounds of dance, after which women sings songs and the men playing tamak and tumdak also sings the song with context to song sung by women. Baha enej(dance) is performed during the eve of baha festival .This dance comprises the men and women . The dance starts with the calling the ‘Nayake’(prist) from his house to the Jaherthan . And at Jaher both men and women dances, when all the rituals at Jaher is completed they take the ‘Nayake’ back to his home with dancing in rows this dance form is called dahar enej. When they reach to Jaher, they dance baha enej. Santali Food is as much as simple as their life, unlike mainstream community, they doesn't include much spices and oil into their diet .And this is the reason they don't get fatty, as they have adopted all things from nature whether it be their living or building houses and thus they get all the nutrition from nature itself. Cultivation of rice is the primary source of food in their diet but the way of cooking and eating rice is different by Santals. 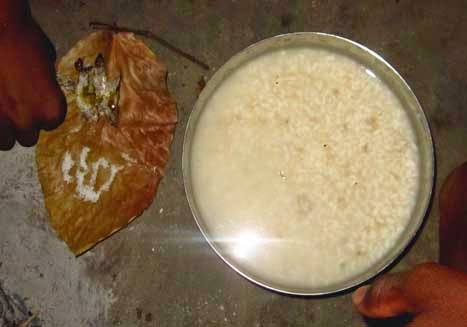 After the rice is being cooked they don't pour out the water from rice instead, they take it whole and it is called 'Da Madi' in Santali, where 'Da' means water and Madi means for Food. With Da Madi, they mainly take green leafy vegetables which is either grown around their house or picked from nearby Jungle. They take non-veg food in regular basis which consist of varieties of fish,frog,crabs,ants,rodents,birds,eggs etc. Art is an integral part of Santal's life. Whether it be building houses, painting it or making bowl, plate out of ‘Sal’ leaf. With help of some braiding technique making brooms and mats. All these things are used in their daily life. The resources or things used in their art are mainly found in nature. Their life style and culture is full of art. The adaptation of artistic creativity in their life has come from nature and needs in their daily life and where some are generation by generation . Their way of building the houses, thatching the roof, decorating the floor, carving the doors and painting the walls signify a lot about the artistic skills and creativity of Santals . The houses in Santals are build of soil and no cement ,bricks are used . First of all, soil is mixed up with the husk of rice so that no crack could come in wall. Mainly soil,bamboo,sal tree and grasses are used for building house. 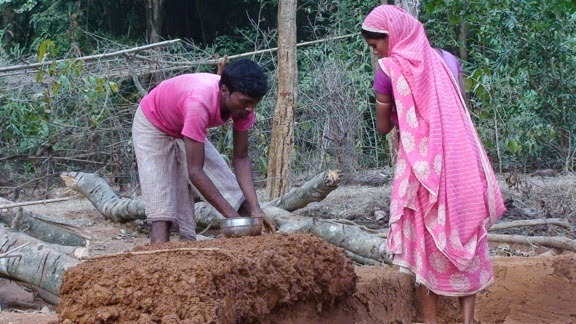 It is their natural technique that with no help of artificial things, only with natural resources the houses build by them can lasts for centuries.